The rooms in the Bed and Breakfast are located on the first and second floors of our house. Unfortunately, we don’t have a lift. You can hire bikes easily, or we can arrange that for you if you’d prefer. There is a cycle shed available that can be locked. 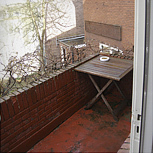 It is forbidden to smoke anywhere in the Bed and Breakfast except on the balcony next to the kitchen/breakfast area. Coffee and tea are available for you at no extra charge. The refrigerator in the kitchen is filled with soft drinks, beer and wine, all available at friendly prices. A wireless network (WiFi) is available for your laptop and mobile phone. The artwork in the rooms is from Natasja van ‘t Ende and is for sale (www.nendekunst.nl). A single room per night (incl. breakfast and tourist tax) 80 euros. 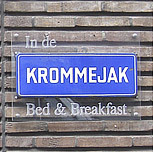 A double room per night (incl. breakfast and tourist tax) 95 euros. A supplementary charge of 5 euros applies for the Saturday and Sunday. You can check in between 14.00 and 19.00, but please agree on a time beforehand. You can check out between 08.00 and 11.00.